Dating all the way back to the Ancient Egyptians, we have been enhancing, drawing and plucking our eyebrows to perfection for years. But how have they changed over time? We’re talking eyebrow evolutions and taking a look back at all of the different trends for those humble, little patches of hair above our eyes. Thin eyebrows were still very much a ‘thing’ in the 1930s. The thin lines were much more curved though, almost semi-circular, and the expression went from sad to surprised! A thicker look crept in during the 1940’s with a more feminine approach to the brows. They were still dark but had a slight arch to appear less harsh and frame the faces of starlets beautifully. The 1950’s was packed with Hollywood glamour and the brows transitioned to a much stronger look, with plenty of definition in the arch and a shorter tail. Think Elizabeth Tailor and Marilyn Monroe in their heyday. Along came the swinging 60’s and eyebrows seemed to take a backseat in favour of graphic eyeliner and imitation eyelashes. Brows were relatively subtle but there was still a lot of work involved in creating the natural look penciling on thin strokes – they didn’t have the luxury of permanent makeup back then! In the years of the hippies and free love, the eyebrows followed suit and took on an ‘au naturel’ look. Women laid off the eye pencils and as a result the brows were lighter. The attitude was free and so were the eyebrows, for better or for worse. The more is more approach was definitely apparent in the 80’s. Along with huge shoulder pads and huge perms came the huge eyebrows. Dark, thick and bushy with no tweezing in sight. In contrast to the previous decade’s trend, the super thin eyebrows were. These very fine eyebrows saw many of us over plucking and having to live with the consequences. Liquid liner was big and the thin eyebrows were raised up high. After the tweezing marathon of the 90’s, the millennium saw brows being lightened and a little thicker. Everyone was probably waiting for the hairs to grow back – if they were lucky! Alongside clothes, music and many other staple attributes which can help define past decades, makeup, especially eyebrows, are obviously placed near the top of the list. 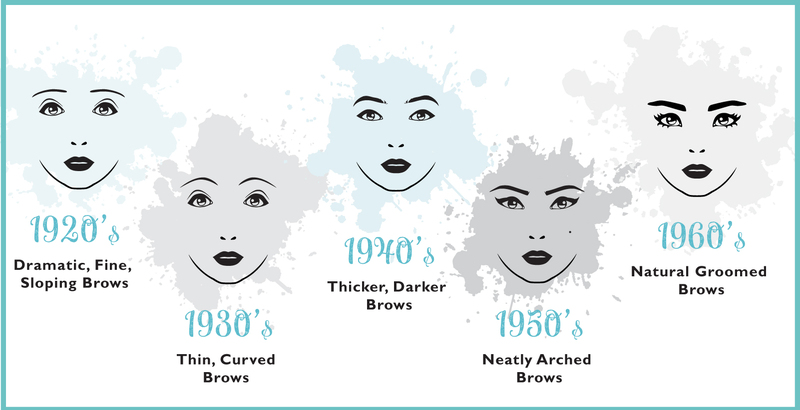 From the dramatic fine lines of Clara Bow and Anna May Wong in the 1920’s to the neatly arched brows form the likes of Marilyn Monroe in the 1950’s and natural groomed brows of Audrey Hepburn and Twiggy in the 60’s, it’s clear eyebrows are a staple feature of the face. We now find ourselves in the era of both the ‘natural sleek brow’ of Kate Middleton and the ‘Power Brow’ donned by the likes of Cara Delavigne, and we couldn’t be more pleased. Beautiful natural shaped brows which perfectly compliment your features are definitely the way to go – we certainly think. No need to panic if you have sparse, thin or over plucked brows. A permanent makeup or microblading treatment could be the perfect solution. Karen Betts and our Elite Permanent Makeup Artists are highly skilled in performing eyebrow treatments to give you beautifully tailored, highly defined, natural looking eyebrows to perfectly suit your face. Arrange a call back with our client services team here, for more information on eyebrow treatments.